Strawberry Road: Throwback Thursday with Mermaid Anya!!! I know I was happy to use some recycled materials in my card! I found this orange sack from a grocery store. I believe it once held a bunch of oranges! I cut the sack up. It is the orange "netting" you see in the background behind Mermaid Anya! Yay recycled goods! This is a more simple layout than my usual approach. I think it's nice to decrease sometimes. To leave out. Use less. And see what happens. Just as an experiment. Does embellishing less scare you? I dare you to try it! No matter what, if you have a great image (such as Mermaid Anya), your card or project will look AMAZING no matter how much or how little flare you care to spare! So what is "Throwback Thursday" anyway? you may ask. Throwback Thursday is a day (once a week, only on Thursdays :) where we Farmers share a less-than-brand-new Greeting Farm image! These are the good 'ol classics! The images we first saw when we were first introduced to The Greeting Farm! Each week, one of us "Farmers" makes a card showcasing these classic stamp images! What is it about Mermaid Anya that I like? you may wonder. Well, she's a MERMAID! Mermaids are cool! I grew my hair out so I could possibly get cast (I act) as a MERMAID! And guess what? It worked! I did! Until the director changed my mind and decided to give my role to someone else, but that's beside the point! :) The point is, Mermaids are TIMELESS, classic, mysterious beauties. Something all women and possibly even some men aspire to be. Who wants to breathe underwater? Have beautifully, naturally long, thick hair? Not have to shave your legs? Who wants to swim all day and night? This girl! If you have any specific questions about this card or my technique, you are welcome to email me at buttercupblogs at gmail dot com. I love the idea of recycling, Buttercup, I'm going to look at my throw away items in a new way thanks to you! I love the accents in her hair, and I love that your chose non-traditional ocean colors, very cool!! Love it! SO cute! 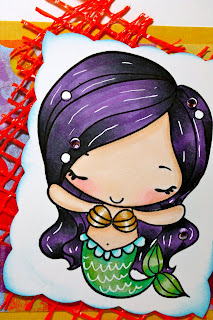 This is a great post and thanks for posting it to the TGF Blog too- Mermaid is gorgeous and I love her purple hair!